An unnamed man from Guangzhou, in Guangdong province, South China, spent $82,000 on 99 identical iPhone 6s to propose to his girlfriend but unfortunately, she said no while leaving him with a bouquet of flowers and likely an empty wallet. reports News Australia (via The Nafang). The man basically assembled his stack of brand new iPhone 6 handsets in the shape of a heart as shown in the photograph below. 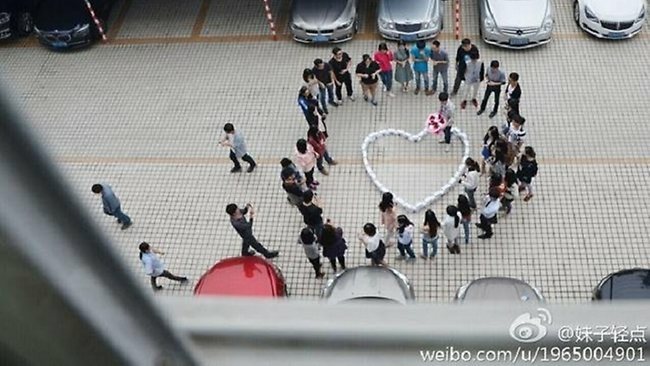 Then standing inside the heart made of iPhone 6s with a bouquet of flowers, he asked his girlfriend to be his bride, all while a crowd of family and friends watched on. Sadly, she said no. To make matters worse, his friends and colleagues were at the ceremony, probably hoping to get a free iPhone 6 for all their troubles. They might not have gotten a thing due to her saying no, so work is going to be awkward for a while. Is it just me or are you guys feeling bad for the poor guy too?